Flavour Emulsions are used in a wide range of foods, carbonated soft drinks and dairy products. Hydration of gums and thickeners is one of the most difficult mixing operations. In some cases the solution has to be agitated for a long period to ensure the gum is fully hydrated. Agglomerates can easily form. These are not easily dispersed using conventional agitators. Partially hydrated material can build up on the shaft of the mixer and on the vessel wall. 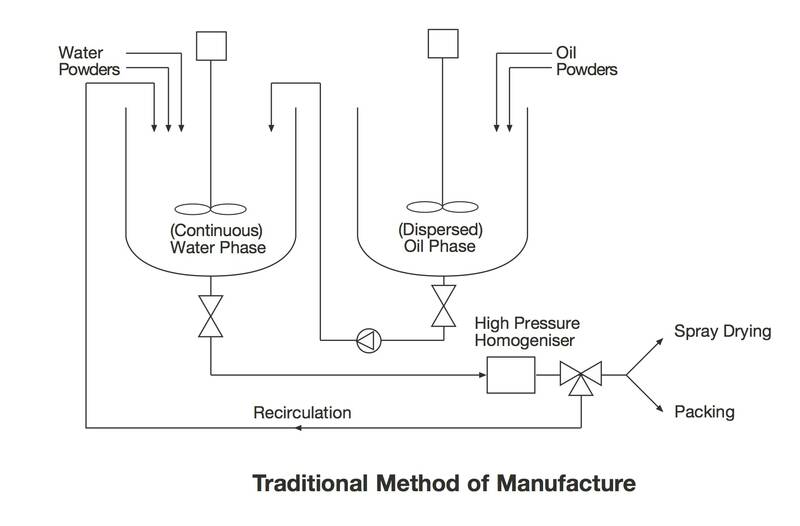 A uniform pre-emulsion is required by the high pressure homogeniser. This is not possible using conventional agitators. This will result in the product having to be passed several times through the high pressure homogeniser in order to obtain the desired globule size. The continuous phase is pumped/metered into the mixing vessel. The mixer is started and the powdered ingredients can be added without premixing. The high speed rotation of the rotor creates a powerful suction which draws liquid and solid ingredients into the workhead, where they are subjected to intense shear. The powdered ingredients are de-agglomerated in the clearance between the ends of the rotor blades and the stator wall, becoming fully dispersed. The product is forced out through the stator at high velocity and returned to the mix, as fresh ingredients are simultaneously drawn into the workhead. The combined intake and expulsion of ingredients sets up a circulatory mixing pattern within the vessel. In a short time all the ingredients pass through the workhead and dispersion is completed. The dispersed phase is added to the vessel and an emulsion is rapidly formed. Particle size is progressively reduced, producing a stable and homogeneous mixture. After processing with a Silverson mixer, a single pass through a high pressure homogeniser is normally sufficient to achieve the end product. The high pressure homogeniser can normally be eliminated for spray-dried products. Typically a globule size of 5-7μm is achievable with a Silverson high shear mixer. 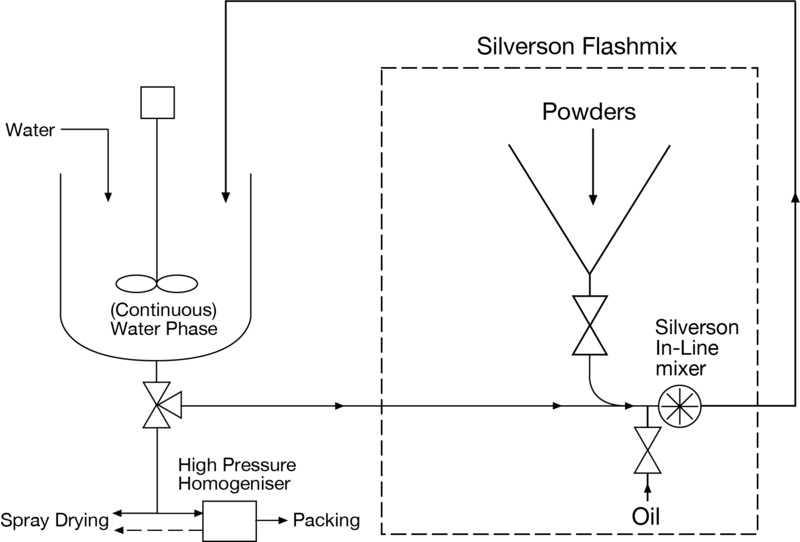 The batch size, formulation, type of ingredients used and the viscosity of the end product dictates which machine from the Silverson product line is suited to individual processing requirements.